"JSJ – Master Jiro Murai"
"Jin Shin Jyutsu - Master Jiro Murai" by Haruki Kato. 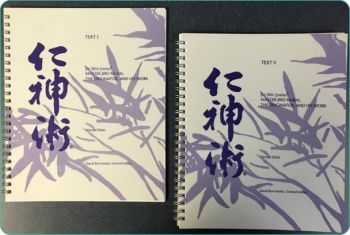 The newest Jin Shin Jyutsu textbooks have been revised with additional text and illustrations from Mary’s original notes, as well as Master Jiro Murai’s original drawings of the 12 Organ Function Energy Flows, Mary’s description of each, and a fold-out page with The Adjustment of The Flows. The information within was lovingly reviewed by the Jin Shin Jyutsu Instructor research team to insure its faithfulness to the Art. It is all presented with crisp drawings on brighter paper. Every student of Jin Shin Jyutsu should have them, as they are the most accurate and comprehensive books to date.